With the premiere of Roy Arbuckle’s magnum opus, ‘The Fountain,’ now mere days away, the Sentinel popped into rehearsals at the ‘Mem’ and the positive energy reverberating around the venerable old venue signalled positive things to come when the curtain’s finally drawn upwards on November 25. Directed by Lurgan-native Michael Nangle, who has worked with Roy before, notably, on the Sam Starrett-penned WWI drama ‘Home for Christmas,’ the final article is now starting to take shape, just over a year after the project was officially launched by the veteran singer-songwriter in Bishop Street. But while ‘The Fountain’ only really started to grow legs last year, it’s something Roy’s been working on all his life, as he explained. Important it is. And choreographer, Nadine Sweeney, echoes this sense of responsibility to the communities that shared and share the city. Nadine, facing a hectic few months herself - she’ll be moving her Fireworks Dance and Drama Theatre Academy from William Street to bigger and better studios in Pennyburn shortly after ’The Fountain’s’ debut run - says she’s really excited to be a part of the project. “We’re starting to really come together and feel each other as a team, not only the cast but the production team as well. The anticipation is starting to grow because we can see the opening night. We can see bits and pieces coming together. “It’s such an unusual production. It’s such a brilliant opportunity for local people to get involved in this. Not only as part of the cast but in terms of coming to see it as well. “I don’t think there’ll be one audience member from any background who won’t be able to relate to some of the songs and the storyline, obviously as well, and I think a lot of the audience members will be really feeling the nostalgia and maybe looking back to times gone by with a more positive perspective, which is fairly unusual as well. Voice coach Ruth McPhillips is a classically trained Soprano who’s been tasked with helping to arrange the chorus and ensemble pieces in the musical. She says the story is very close to her own heart and confesses Roy’s music is wonderful material to work with. “It is but it’s an amazing production. I think the storyline is really close to my own heart. It’s a lovely, lovely show. “The music has made it easy for me. It’s very forgiving and it’s very easy to write harmonies that reflect the true meaning of girls from the town. “The whole ethos of the show, for me anyway, is, through thick and thin, we will get through it. You’ll always see the light at the end of the tunnel. Roy’s long been familiar to audiences far and wide for his own brand of folk, country and rock and roll. But moving into musicals....How’s that been? “Sometimes I wonder, what am I doing? No. The other side of that is that it was pretty easy in lots of ways, you know, for me to write it has been easy, because I know the place, I know the people, I know the way they sound, I know the kind of conversations people have and the way people say things, and as I say the songs dictated...you know, I’ve got my ‘Factory Girl’ song, because a lot of the history of the Fountain was connected with the shirt factories. All the women I ever knew when I was growing up worked in shirt factories. Nadine, who has worked with Roy on various projects over the past few years - she provided backing vocals on his 2014 ‘Shoulda Wore Me Jumper’ release - says she knows the musical is going to viscerally affect anyone who comes along to see it. “It’s so unusual. I don’t think there’s an expectancy at the minute. We just know that the script stands for itself and now all the pieces are coming together. “We are really looking forward to seeing how the audience respond and we’ve had some people from different community groups already, come in to see the rehearsals and tell us their stories as well, which is a big element of Towards Understanding and Healing [the Bishop Street-based peace body, which has helped facilitate the work] through, which this production is associated. “Some of the pieces within this production will really affect them and resonate with them and everyone who’s in that audience will be able to relate. And the venue, where Roy’s musical career began back in the sixties just a couple of hundred yards of a jive away from New Gate and the Fountain itself, that’s pretty important too. “There’s something special, it’s a bit mysterious, about doing pieces of work, pieces of art, in the places that they are about,” says Roy. “We found this years ago with a play of Sam Starrett’s that I did out in the YMCA. “They were doing that play in the place it had been written about, out in Drumahoe, you know. The story was written there and they were doing it there. “It’s...I don’t know. There’s a sense of something kind of magical happens. I find it hard to explain but there’s a difference. “You take the same play, the same actors, the same thing and put it on somewhere else and it’s not quite the same. You know it’s like the spirit of the place or something mysterious like that comes around. For Roy it’s about chronicling a bit of Londonderry’s recent history and his own history as well. “I was born in Bennett Street and my mother was from the Fountain, my father Ivy Terrace, so we’re from that Greater Fountain area, though we moved up to the Northland when I was six or seven. “But the Fountain was always the centre, the social centre of the city centre, you know, coming out of the boys’ clubs, the Boy Scouts and the Boys’ Brigade and all that. “Then I lived for a while in the Fountain in the sixties. I suppose that sense of community that was there is what I’m trying to grasp, to remember through the songs. The musical opens on November 25 in the Memorial Hall. Tickets are available now from the Millennium Forum box office. 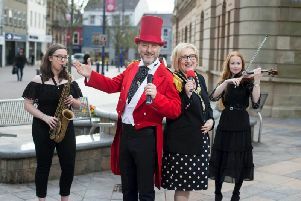 ‘The Fountain: A Musical’ has been supported by a range of funders including the Arts Council who were first to back the proposal which has since drawn support from the Office of the First and Deputy First Minister, the Inner City Trust, from the Apprentice Boys/Siege Museum and from Derry City and Strabane District Council as well as good relations and peace building organisation, Towards Understanding and Healing.